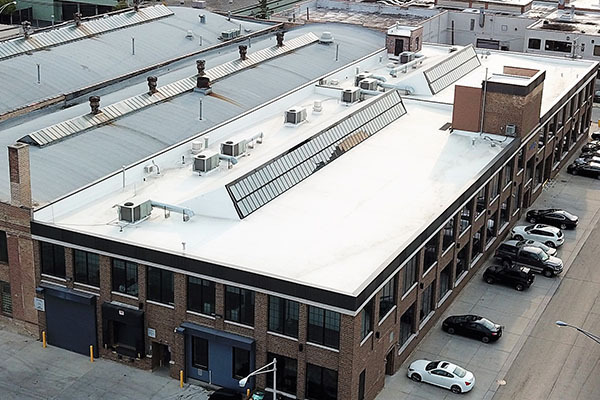 Thermoplastic (TPO) roofing gives you a long-lasting system that decreases the need for costly roof restoration services or roof repairs to your Chicagoland roof down the line. TPO roofing membranes are compounded from a blend of polypropylene (PP) and ethylene-propylene rubber (EPR) polymers. Flame-retardants, pigments, UV absorbers and other proprietary ingredients may be included in TPO roofing formulations. The membranes usually are produced in white sheets, but other colors may be obtained as well. They are aesthetically pleasing, lightweight, highly reflective and tear resistant. TPO roof membranes exhibit positive physical properties, such as heat aging, cold temperature flexibility, puncture resistance and tear strength. They also are resistant to degradation from exposure to animal fats, some hydrocarbon oils and vegetable oils. They also are resistant to microbial attack and will not support the growth of microorganisms. TPO roof membrane systems may be specified as ballasted, fully adhered or mechanically attached to an approved substrate. Fully adhered systems may be bonded using liquid adhesive or a factory-applied self-adhering adhesive. On a sunny summer day in Chicagoland, a black roof can reach temperatures in excess of 170 degrees Fahrenheit. On the same day, the highly reflective white surface of a TPO Roofing System can be as low as 110 degrees! As a result of the high reflectivity and emittance qualities of the white membrane, much less solar radiation is transmitted through the roof and into your Chicagoland facility or home.